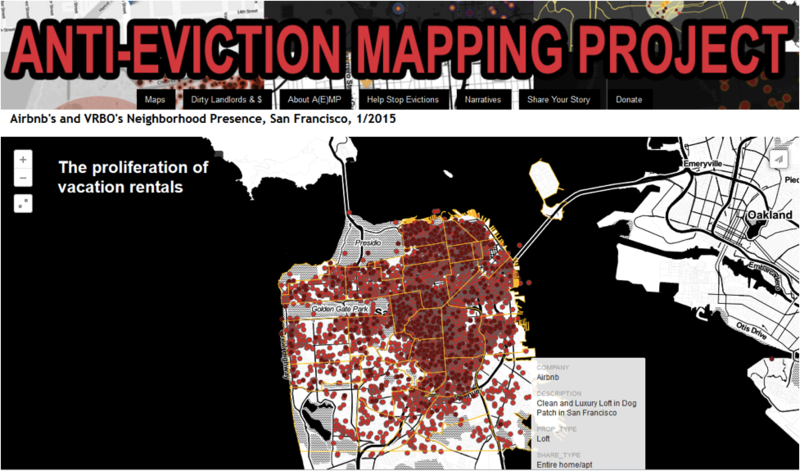 Founded in 2012, the Anti-Eviction Mapping Project (AEMP) is a data-visualization, data analysis, and digital storytelling collective documenting the dispossession of San Francisco Bay Area residents in the wake of the Tech Boom 2.0. They create tools that contribute to collective resistance, and that can be used by diverse communities in movement building. Other Cinema is proud to have previously hosted Erin McElroy (interviewed here) and collaborators in a slideshow presentation on her work with AEMP. What is the overarching eviction dynamic occurring in the Bay Area that Anti-Eviction Mapping Project seeks to address? Evictions have been skyrocketing since 2011, correlative to Tech Boom 2.0. We’re seeing communities that are already marginalized become displaced from their communities in San Francisco. Because rents are so expensive, when people are kicked out of their homes, they’re oftentimes being kicked out of their city altogether. 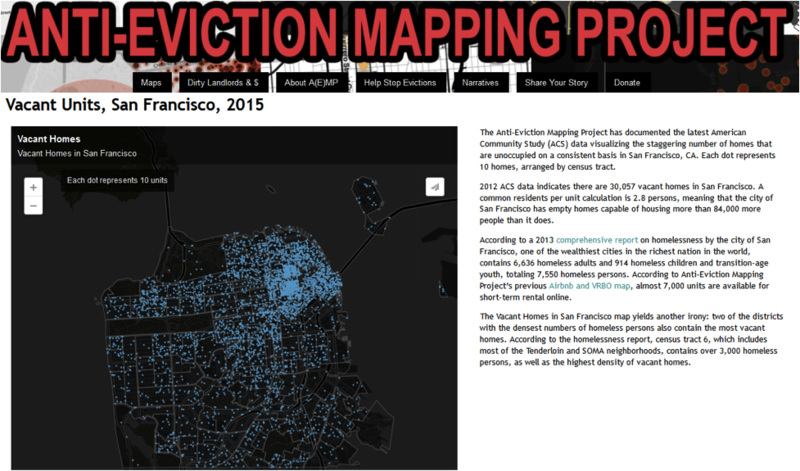 What is the Anti-Eviction Mapping Project? AEMP is a data visualization, data analysis and digital storytelling collective housed in the San Francisco Tenants’ Union. We’re documenting the dispossession of SF Bay Area residents, specifically over the past few years. What makes us unique is that we are largely working through a mutual-aid model, collaborating with tenants and different organizations – really working from the ground up. We’re interested in visualizing and creating data that fuels both direct action and shifts policy, but we’re not a specifically policy-focused group. We’re also unique in that we are very interested in analyzing the eviction crisis in terms of the larger systemic intersections of racism, classism, ageism and ableism. What are some of the statistics from the crisis that really jump out to you, highlighting its nature? From 2012-2013 we saw Ellis Act eviction rise 175%. We saw no-fault evictions rise 115%. In 2012 we saw that 72% of the people evicted through the Ellis Act were either above the age of 62, and/or disabled. We also saw that from 2011 on, 69% of no-fault evictions occurred within 4 blocks of tech bus stops. So all that data shows us that seniors and people with disabilities are being evicted through no fault of their own, specifically proximate to private tech bus stops. That’s of course not because tech buses are evicting tenants, but because landlords and speculators are taking advantage of the money the tech industry is generating to kick out long-term tenants who are living in largely rent-controlled housing to create housing for people with much more money who want to be near transportation that will take them to work. All in all we’re seeing that these evictions and rents are very much correlative with the trinity of tech companies, real estate and local and state government. What are some projects from AEMP that were particularly effective at addressing the housing crisis? Our very first map showed Ellis Act evictions accumulating over time from 1997 onwards. We also produced a map showing no-fault evictions in relation to the tech bus stops. Both maps raised significant awareness. More recently, we produced maps detailing killings by the San Francisco Police Department (SFPD) and the Oakland Police Department (OPD). We’re definitely interested in producing maps visualizing displacement by demographic. What we’re trying to do, of course, is link evictions and displacement within a broader political economy and looking at ways that communities of color historically and presently are being disproportionately targeted and displaced. What are AEMP’s current projects? Right now we’re in the middle of a project in which we’re looking at quality of life crimes reported to the police, in relationship to increases in property value because we have a hypothesis that as neighborhoods are gentrified, gentrifiers are more likely to call the police on their neighbors who might be homeless, or poor, or just hanging out on the street. We’re very much interested in that dynamic. We’re also in the middle of an Oral History Project that we’ve been working on for well over a year now and in that project we’re looking to learn more about what those individual dots on a map mean. We’re trying to look at what stories and lives and legacies they have brought to the city – legacies and lives that are now being displaced. So we’re trying to humanize and better understand the contours of the eviction crisis through these stories. Looking at those individuals themselves, there’s been a particular impact on the art community in San Francisco. What is that impact? I remember just even 4 years ago there were so many more art collectives and spaces in the city than there are now. I had friends who lived in art collectives that are now the offices of different startups. It’s really sad because I think artists bring a lot to a city, and in this city, so many kinds of art have been produced and we’re seeing that become narrowed. We’re seeing artists of course being displaced and having to move to other cities and other areas. What we’re seeing, not just in San Francisco but across the US, is that because artists generally make less money than their contemporaries, and because they’re looking for these work-live spaces, they’re often attracted to areas that are just beginning to gentrify because there are conducive spaces available. It’s unfortunate because artists can actually unintentionally begin fueling the cycles of gentrification and then finally get displaced themselves. You can see that in Williamsburg. You can see that happening in Oakland now. But in San Francisco, we’re at the tail end of that process and artists can no longer afford to live here. The Project has received a lot of media attention, having been featured in dozens of major outlets. Can you tell us about the nature and the impact of the coverage of AEMP’s work? We definitely have received more media attention than I ever imagined, which speaks to just how significant what we’re depicting is to different communities. I think that from the beginning we’ve been looking to create maps and data and visualizations that we believe should be made public and accessible – they just haven’t been. So because we’re operating from a community-oriented perspective, we’re able to create these visualizations that break isolation in ways that empower tenants. We’re not just creating visualizations that will be used in a fancy report that will never see the light of day, but we’re trying to create data that will fuel movement-building.